Tanner is playing baseball again this fall. 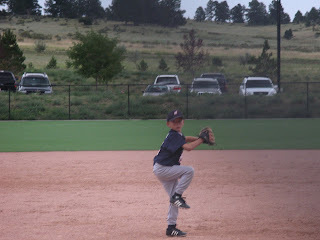 He is playing kid pitch for the first season and is the only 6 year old on the team. He has suffered a few strike outs which has been an adjustment for him. But, he has had the opportunity to pitch, play first base, second base, catcher, and center field. He has done an amazing job at each of the positions. He really is a gifted athlete and is mature beyond his age. It is such a pleasure to watch him play and especially fun to see his enthusiasm for sports. I don't know how you keep up with all the sports! It makes me tired and grumpy just thinking about it! GO TANNER! His pitching looks good in the photo. It's so fun watching the boys play sports. I know Alec loves it when I cheer for him. Tanner has great form! that is a awesome picture. GO Tanner man.